This is a rather strange book. I have read quite a number of books, both children’s books and books for mature minds. But I cannot think of any book that is quite like The Little Prince. I cannot even decide whether to call it a children’s story or a book for grown-ups. I am sure the author, Antoine de Saint-Exupery, in spite of being an adult himself, would have strongly objected to its being called a book for grown-ups. He has even dedicated the book to a grown-up, Leon Werth, “when he was a little boy”! The day I read the book was the second day of dad’s admissions. It had been a very long day, and by the time it was nine in the evening, we were all dead-beat. 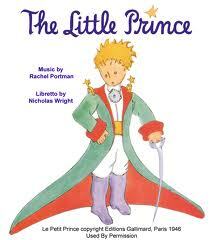 I wanted to read something light, so I took The Little Prince out on a whim and curled up in bed with it. I had been expecting a funny and frivolous book, but right from the first page I could sense something very surprising; the author seemed to have turned society as we know it upside down. In his opinion it is the children who are the really deep and thoughtful entities in society, and the adults who insist on giving undue importance to petty and unimportant things! The author starts the book by telling us how he had drawn a boa constrictor with an elephant inside it when he was six years old, and had asked the grown-ups whether the drawing frightened them, but they had all thought that it was an oddly shaped hat that he had drawn. He must have been a very unusual adult indeed, because right at the start he has made clear his low opinion of the average grown up. And this is a theme that he has continued to harp upon throughout the course of the story. He insists “Grown-ups never understand anything by themselves, and it is tiresome for children to be always and forever explaining things to them”! The author, who has grown up to be an aviator, has had to crash land in the Sahara Desert as something has broken down in the engine of his plane. It is there that he meets the little prince, who seems to appear out of nowhere, and asks the author very gravely to draw him a sheep. And strangely enough, the author does just that for him, as “when a mystery is too overpowering, one dare not disobey.” That is the beginning of what goes on to become a deep friendship between the grown man and the strange child. The story stretches over ten or eleven days, during which the author comes to know little by little the story of the little prince’s life. The little prince lives on a planet (the author thinks it is the asteroid B-612, though he acknowledges that any child would know such names and figures are of little consequence; it is the adults he is satisfying with this piece of information) which is so small that it is hardly any bigger than a house. He lives there with three volcanoes, and a haughty flower who thinks she is the only one of her kind. He used to live with his flower and watch many sunsets, because his planet is so small that the sun sets and rises numerous times each day. But the little prince was not happy, and wanted to travel around and see the universe. That was how his adventures began. The author has memorably conveyed many essential lessons of life through the little prince’s adventures. He has also brought out some of the commonest weaknesses that grown-ups suffer from in the characters of the various people the prince meets on his travels. The price meets a king who loves to order people about and rule over people, and his only problem is that there are no subjects he can rule over in his tiny planet. Then the prince meets a conceited man who thinks everybody admires him, and then a drunkard who drinks so that he can forget how ashamed he is of drinking, then a businessman who counts stars all the time (‘stars’ here seem to me to be representative of money). The fifth planet the prince visits has a lamplighter whose plight is that he has to light his lamp and put it off 1440 times every day, as there are so many sunsets and sunrises in his tiny planet. Of all the people he has seen till then, the lamplighter is the only one whom the prince does not find ridiculous. The reason the prince gives for this is “he is thinking of something else besides himself.” The sixth planet has a geographer in it, who directs the prince to the earth. The part that has touched me the most is when the prince goes to the snake, who bites him so as to send him back to his own planet. Before going, the prince reassures the author that he will not be dying; he will only be leaving his body behind, as it is too heavy to carry home. This wonderful concept of ‘going home’ seems to take away a lot of the anxieties and miseries of human life. When one knows that death is just going back home after a long and tiring journey, one is able to face it without fear, and with anticipation even. I am so glad that you pinned the ramblings (as you call it) of your "restless mind" down on your blog. I've been waiting and of course, as usual, you posted on a day when I just wasn't expecting it! Truth be told, it's one of the strangest books I've ever read and I can't for the life of me remember how old I was when I did read it the first time (but I'm sure I'd joined college by then because I think I read it on the train), and yes, I'll solemnly agree with your dad that it's a book that changed my life too, and changed/altered something about my Self, and the way I saw the world. It made me dare to hope too...when there was very little hope. I can't help but smile with your last liner...I'll say a hearty "yes, yes, yes" and an “Amen” to that. Just today while out on my walk I was smiling and smiling a lot when I remembered that liner of yours. Nice review, and I am pleasantly surprised by it, since I'd thought that this book was intended for a much older audience. Perhaps it is one of those that you can read at different times in your life and get different things out of. I read this book for the first time a couple of years ago. In fact, I think I'd borrowed it from your father. We had a chapter from this book (the part where the Prince meets the fox) in our first year of college. It took me five or six years to get around to reading the entire book. I had almost forgotten most of the story till I read your review. Now I do feel I need to read it again, thanks to the review. I hope you find the rose you seek! A very fine review,and one worthy of its salt. 'The Little Prince'is one such book which can yield multiple meanings when viewed from different viewpoints and angles of thought.As the saying goes,"The truth ultimately is important.Arrive at it from any angle you might wish to. "You have interpreted the truth in your own way,and it is a very charming one indeed.How I too wish I find my rose that shall tame me lifelong!The further I progress in Life,the more I find it difficult to retain that childhood sense of wonder,like a Columbus!I might say that a quote of Einstein aptly sums up one of the key philosophical tenets embedded in this little gem(It might be the cornerstone of this fine little review too! )-"There are only two ways to live your life.One as if everything is a wonder,a miracle;or as if nothing is a wonder." May you always have the singularly good fortune of being able to live like the former! P.S-I think Sir's comment says it all!My comment might be at the best,superfluous.After all,I am just another engineer. Although I am a little late in the day, but thanks a lot, Pupu, for making me read this book. It sort of changed the way I look at things. That love is really being tamed and in all the right sense of the word is something that I have always felt, but I felt validated by this little book, otherwise big in so many ways. Thanks a lot. I intend to connect your post to a post that I intend to write on this book, sometime. Of course, I need a by your leave. This was a very nice read. According to me - the author hasn't really said anything wrong. This is one of the things that Suvro Sir often said in our classes- that children are more thoughtful and intelligent than most of the adults are. I haven't read the book yet- but after reading your review on it- I would like to grab hold of it as soon as possible. My apologies, Sohamda, for taking so long to publish your comment. It has been a long time since I opened my blogger account, our of sheer laziness I confess, and for some reason your comment did not show up in my gmail inbox, hence this delay in publishing it. I do hope you are not too offended. It's alright. I am not offended. At first it seemed a bit odd to me that why my comment didn't show up here. But later I realized that you might be busy with something else. I have read some posts on your blog and I think everyone of them is nice while some of them bluntly points at the truth that most of us don't accept. Thanks a lot for the review. I read the book today, and though I haven't read half as many books as I should have, I know that this will be at the very top of my list of favourites, perhaps for as long as I live. It is a book, I know, I will have to come back to, time and again, throughout my journey through life. It is a book that I will have to savour, digest, contemplate, perhaps even understand, thoughts and feelings resonating with that of the author, a little at a time, and perhaps this will process will go on for as long as I live. And as long as the process continues, I know I will not have whiled my time away. Sorry for that rambling, but no amount of praise is enough for a writer who could write such a book. The book is eternal, I daresay, in its deep reflection, in its thoughts and ideas, in its fearlessness of calling a spade a spade and bringing to surface the loftiest of thoughts and deepest of emotions in the form of a simple, beautiful, almost poetic 'children's' book, and most of all in the amount of tranquility it provides to the reader, as sweet water quenches the thirst in the desert. Thanks again, for writing this lovely review.